Exchange Server 2007 ActiveSync supports synchronization with multiple client types, including some non-Microsoft device operating systems. In general, however, the best feature set support comes from the Windows Mobile 5.0/6.0 devices. Windows Mobile 5.0 devices can be integrated with the Messaging Security Feature Pack to encrypt data and to allow for remote password reset and remote wipe capabilities. Windows Mobile 6.0 has added capabilities, such as the ability to access file data via UNC paths and document management capabilities via Microsoft Office SharePoint Server 2007 Document libraries. There are two flavors of Windows Mobile available that can be synchronized with Exchange. Windows Mobile Pocket PC Edition is for full Pocket PC devices, many equipped with a stylus and/or a keyboard. The other version supported is the Windows Mobile Smartphone Edition, which is limited to traditional smaller phones, such as clam-shell flip phones and non-keyboard units. The configuration steps for both versions of the OS are outlined in this section. From the Windows Mobile screen, click Start, Programs. When prompted about syncing options, choose the Set Up Your Device to Sync with It link. Enter the FQDN of the ActiveSync server into the dialog box shown in Figure 1 and make sure the This Server Requires an Encrypted (SSL) Connection check box is checked. The FQDN should match the name on the certificate. Click Next to continue. Figure 1. Configuring server settings with ActiveSync. Enter a valid username, password, and domain, and then choose to save the password. Click Next to continue. Choose which types of data will be synchronized from the dialog box shown in Figure 2. Clicking on Calendar or E-mail and choosing Settings allows for customization of the amount of data to be synchronized. Click Finish when you are done. Figure 2. Syncing calendar, mail, and contact information with ActiveSync. Click the Sync button to connect to the Exchange server. The Mobile device will start synchronizing automatically. Synchronizing can be enacted manually, or if the Windows Mobile device supports Direct Push, the emails will be automatically pushed out to the phone. The hardware on many smartphones is different, and some of the button options in this step-by-step procedure might vary. The overall concept should apply to any Windows Mobile 5.0 Smartphone Edition system, however. From the smartphone, press the button corresponding to the Start command. Navigate to ActiveSync and press Select/Enter. When prompted with the dialog box shown in Figure 3, select the Set Up Your Device to Sync with It link. Figure 3. Setting up Windows Smartphone Edition for ActiveSync. 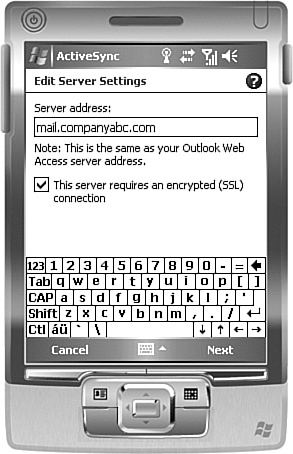 Enter the FQDN of the ActiveSync server, such as mail.companyabc.com. Check the box to require SSL, and press Next. Enter a valid username, password, and domain, and check the Save Password check box, as shown in Figure 4. Press Next. Figure 4. Entering credentials for ActiveSync. Select which data will be synchronized from the subsequent dialog box, such as contacts, calendar, email, or tasks. Press Finish. 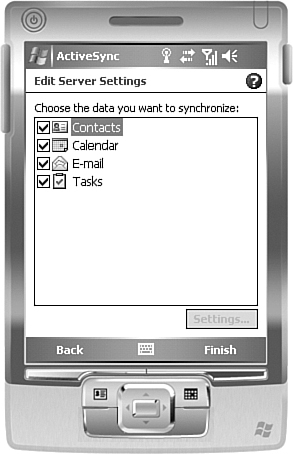 The phone will then begin syncing with the ActiveSync server. Microsoft has released a software emulator for Windows Mobile 5.0 that can be used for testing, troubleshooting, and code development on the platform. 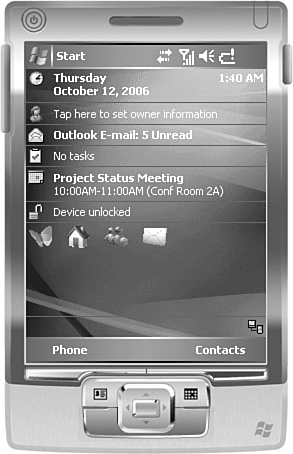 This tool, shown in Figure 5, allows for different Windows Mobile skins to be used for testing purposes and is an excellent way to test out an ActiveSync deployment in a lab environment. Figure 5. Viewing the Pocket PC emulator.